Tickets, please! 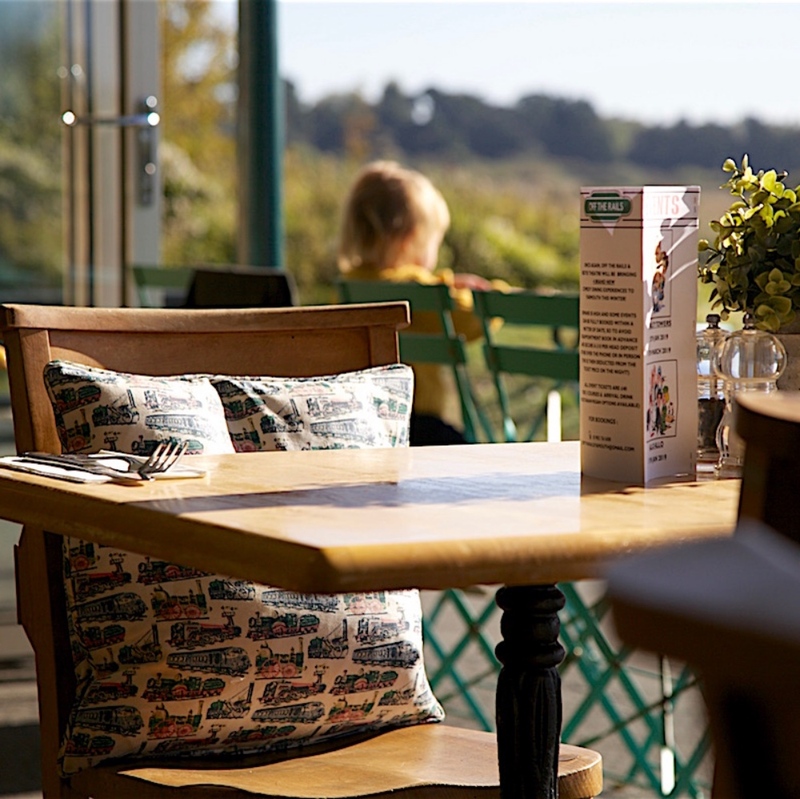 We nipped to Off The rails on the IoW to confirm its First Class foodie credentials. 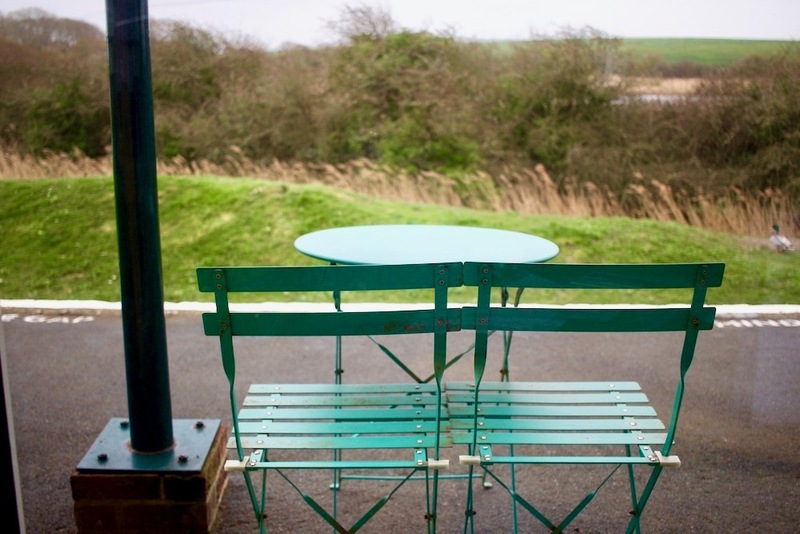 Located in an old converted train station, tucked away from the main thoroughfare of Yarmouth, Off The Rails is a restaurant that serves food as unusual as its venue. The line closed back in 1953 and the building has been everything from meeting venue to youth club, before its current transformation into eatery back in 2014. If you know of any trainspotters, they will deeply envy the decor in here. 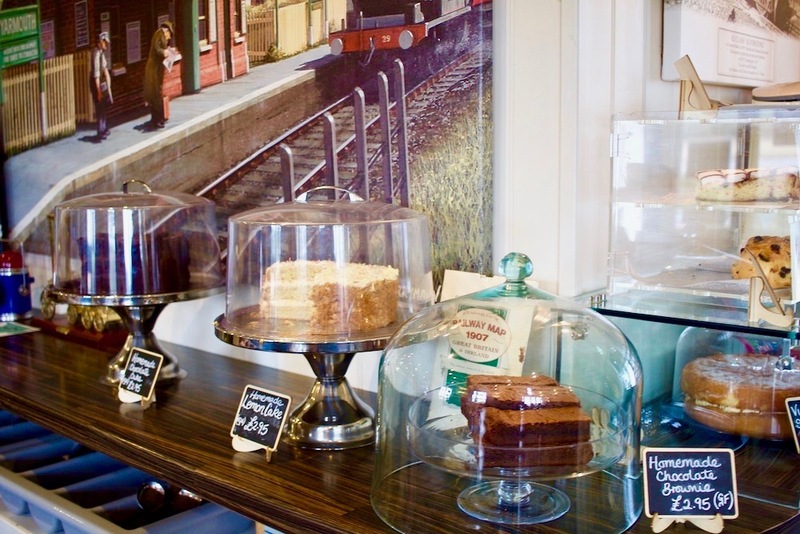 Fully embracing its railway roots, there’s a nostalgic glut of railway memorabilia dotted around the interior and despite its slightly geeky nature, it’s wonderfully charming and warm. 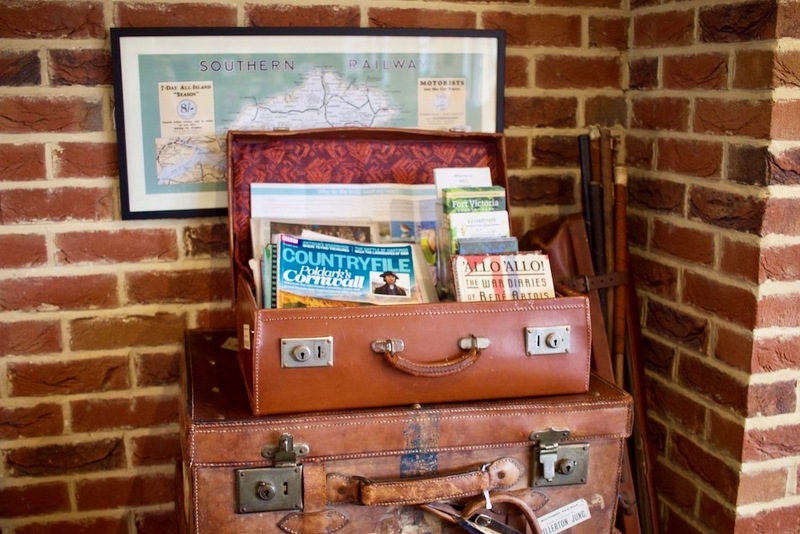 It feels a bit like transporting back to the 50s… but with Wi-Fi available. With exposed brickwork and big old bi-folds for the summer months, they even have booths crafted from old train seats which are both quite impressive to look at, but really comfortable as well (they knew how to travel in class those days). 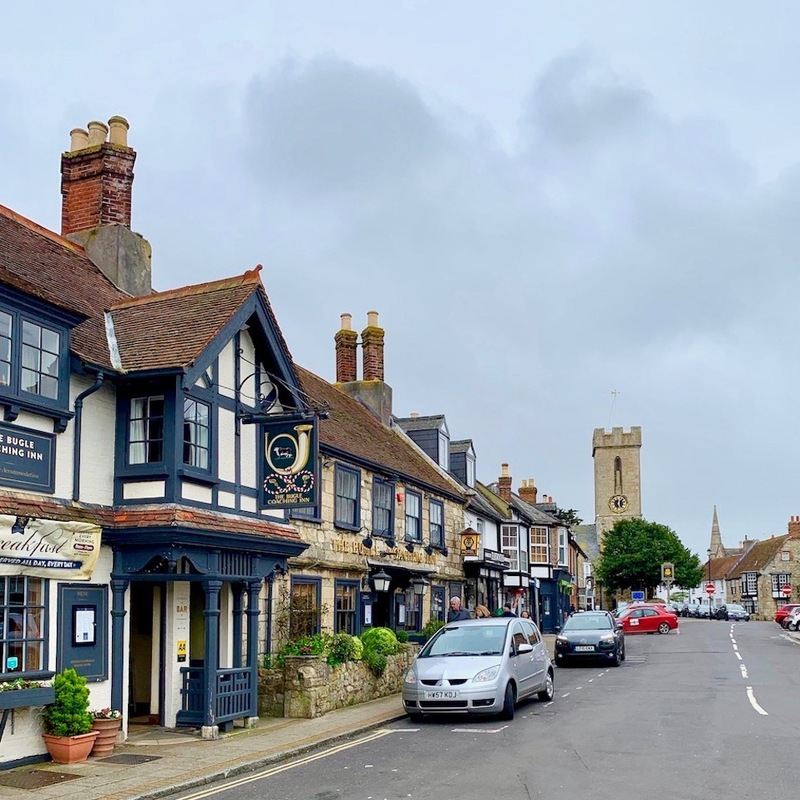 It’s a very busy spot – popular with both locals and those who have stumbled across it coming off the nearby car ferry. And they love four-legged customers here, in fact, they even have their very own dedicated dog menu complete with ice-cream for those hot summer days. We arrived on a wet and very windy Saturday in March and although we were told it was relatively quiet, every table was filled with customers. There were families on a weekend outing as well as people from the mainland, plus many of the aforementioned pups eating their special dog meals. During the summer this place is packed. 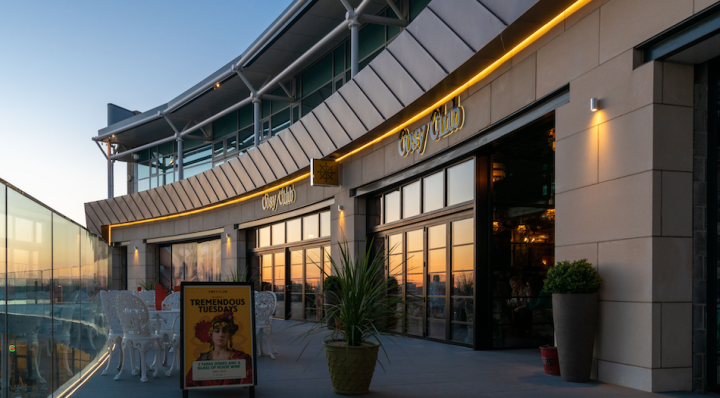 The former station platform has been transformed into a gorgeous mini-terrace, the perfect spot to eat lunch and enjoy the (rather incredible) view from. They serve breakfast, lunch and dinner here, as well as a range of cakes and pastries for those just dropping by for a snack. Along with amusingly named items such as ‘Mind The Gap’ (a classic Reuben sandwich of braised brisket with Russian mayo) and ‘Yardmaster’ (pork belly Carbonara), they also have a rather striking burger on the menu called ‘The Suitcase’. This particular burger looks straight off an Instagram feed with its black charcoal bun, smoked bacon jam and pink onions, it’s even served in a wooden suitcase – yep, a wooden suitcase. We decided to go a little less avant-garde. 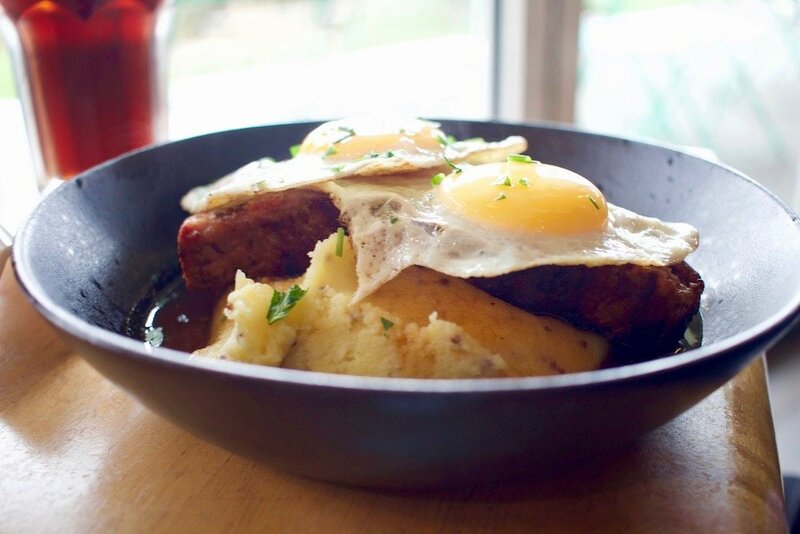 I ordered the Hunter’s Special of the day, pork belly hash with Balsamic glaze, mashed potato and a fried egg. My dining companion ordered a ‘Doodlebug’ from the lunch menu- a Bavarian Smoked Meatloaf, mash, fried eggs and pineapple gravy (Ok, maybe still slightly avant-garde). The pork belly was slow-roasted to a tee and thus incredibly tender. The accompanying mash was creamy and went surprisingly well with the gooey fried egg and balsamic topping. I also managed to try some of the meatloaf and it was divine, with a deep flavour, excellent texture and no grisly bits. It worked in harmony with the rather unusual – but totally delicious- pineapple gravy. The drinks selection here is pretty good as well, with a streamlined range of wines (the manager is French so you know they’re good!) and cocktails with the usual suspects such as Espresso Martini and a Smoked Bloody Mary on the menu. 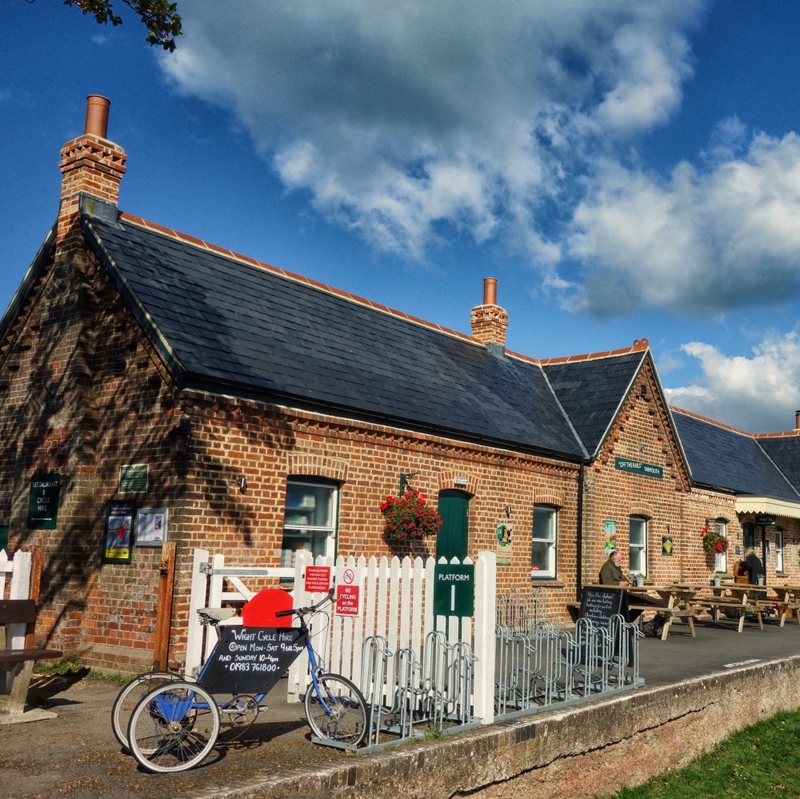 Surrounded by the gorgeous Isle of Wight countryside, you can meander along the now disused rails to Freshwater, with miles of footpaths and cycling routes. In fact, you can even rent a bike at the restaurant if you’ve forgotten to bring your own. Yarmouth as a town is incredibly chocolate-box and provincial, with boutique shops selling all sorts of seaside themed wares, a lovely delicatessen that stocks local produce and the English Heritage owned, Yarmouth Castle to look around in. Yarmouth is also quite famous for its pier and was originally built in 1876 for the ferry and steamers to dock at. 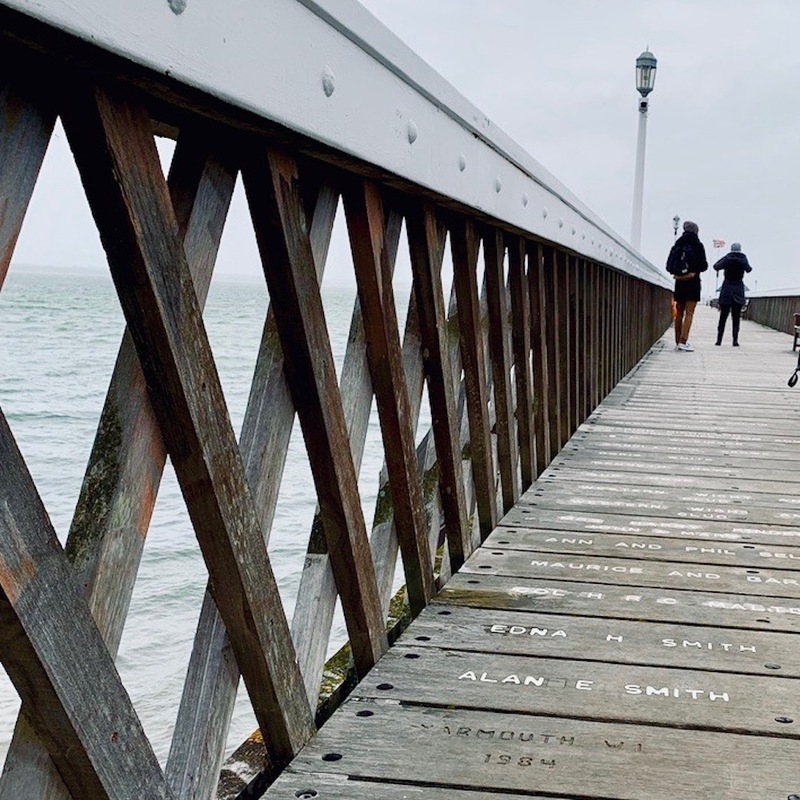 Nowadays it’s a Grade II listed structure and as the longest wooden structured pier left in the UK, it’s perfect for promenading along. There’s a 50p donation to enter the pier via an honesty box. GOOD FOR: Families, day-trippers, dog walkers and people looking for an untapped foodie spot. The menu here has some very exciting food on it and is worthy of a few visits to try them all. 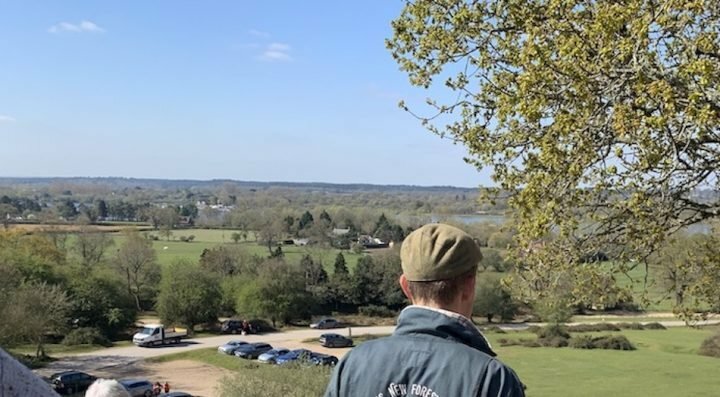 If you’re looking to come here by car, make sure you park up in one of the nearby carparks as there are limited spaces by the restaurant and residential parking is usually full. NOT FOR: People who don’t like animals. There’s tonnes of dogs here, as well as some extremely friendly ducks and swans that will walk right up to you. If you have a particularly fussy kid as well, they don’t have a children’s menu here and instead serve up smaller versions of the main menu. THE DAMAGE: £- Extremely reasonable for its proximity to touristy spots. 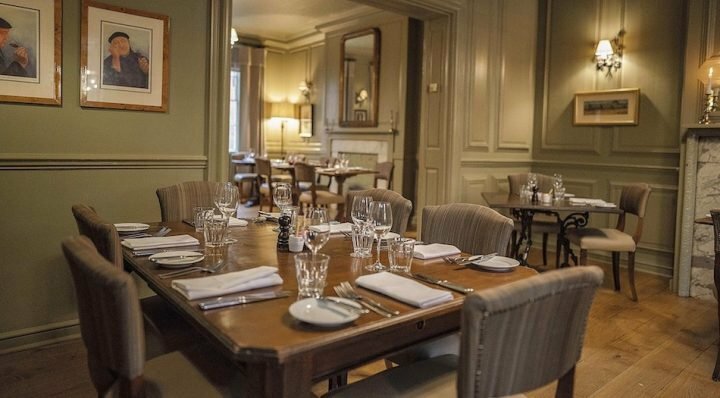 With most lunch mains costing between £12 – £14 and evening meals averaging around £17, it won’t break the bank and you’ll have plenty of pennies for the cocktails which cost £8.50 each. Wine is sold in carafes rather than by the glass with £7 getting you a 250ml measure and the average bottle costing around £20.